Well they finally did it. SJWs just couldn’t hold back anymore, and violently attacked a YouTuber at GenCon. Worldcon, in particular, is a sign of what happens when people not in agreement with the left have had enough and withdraw. Not only does it devolve, fast, but they continue to blame all their problems on people to the right of Lenin. Let’s be frank, the left don’t really mean to destroy anything, any more than the locusts mean to destroy farmers’ crops. They don’t even have an understanding of farmers’ crops or of destroying, just like the left doesn’t understand economics or society enough to know what they’re doing. In the end, locusts want to survive and to make more locusts… and the left wants the same, which is why no club, no hobby, no field of endeavor will be left alone. They must enforce their way of thinking and their image of the world everywhere until in the ruins of a destroyed world there stand a group of leftists discussing the wonders of Marx and preening for the few survivors. SJWs are bullies by their very nature, and bullies always stupidly lash out when power is taken away from them, or whenever they’re openly defied. As SJWs continue to rightfully lose power that they never should have had in the first place in arenas that actually matter, frustrations within uneducated SJW pea-brains will continue to exacerbate. Currently the only place left that SJWs have any power at this point in time is within the cultural constructs of various hobbies, and they don’t want to let it go. SJWs can’t effectively argue their positions, because they simply don’t know how. SJW bullies are deeply ignorant and always incapable of articulating arguments in an arena of free speech, which is why they work feverishly to impose speech restrictions either through nudging change in cultural morals or forcibly through legislation. But when free speech is allowed and they have no ability to control the narrative, the only recourse they have left is physical violence. We are now dealing with entire generations who have been coddled in university “safe spaces” where they are protected from viewpoints that they might disagree with. It’s easy to see why a safety-obsessed culture would issue trigger warnings and focus on microaggressions. According to Haidt and Lukianoff, trigger warnings evolved in online forums where they existed to protect traumatized people from triggering reminders. Further, they argue that “vindictive protectiveness” cultivates pathological thinking. For example, microaggression theory, which sees small slights as systemic oppression regardless of the speaker’s intent, has been a tool to limit campus debate and discussion. So what we’re now dealing with is generations of people who can’t handle contemplating differing viewpoints, and either fall to pieces, or resort to fist-a-cuffs in order to cope with the existence of opinions other than their own. And these are the people who routinely delude themselves into thinking that they’re “punching Nazis,” all the while being blissfully unaware that it is they themselves who are engaging in Nazi-esque behavior, specifically because they are so uneducated. According to him [Jeremy], the attack happened at one in the morning and it took three people to pull off the attacker who began his attack by randomly walking up to Jeremy and inquiring about his identity. It doesn’t stop there. After the attacker was pulled off Jeremy, Jeremy walked into a bar called “The Tin Roof” where the owner attempted to stop Jeremy from calling the authorities. However, Hambly was able to call the police and filed a police report. Hambly claims the bar didn’t do anything to protect one of its patrons. He claims it didn’t have a bouncer and didn’t keep the guy out. The bar also refused to call the police. The attacker is Matt Loter, also known as the Prettiest Matt, owner of Elm City Games in New Haven, Connecticut. Even more dusturbing, was the fact that the GenCon Twitter account was blocking people who were asking for information on Jeremy’s attacker. GenCon was also outright banning people from their livestream for asking them for comments on the assault. As far as we know, Matt Loter has not been removed from GenCon for his assault, as he should be. 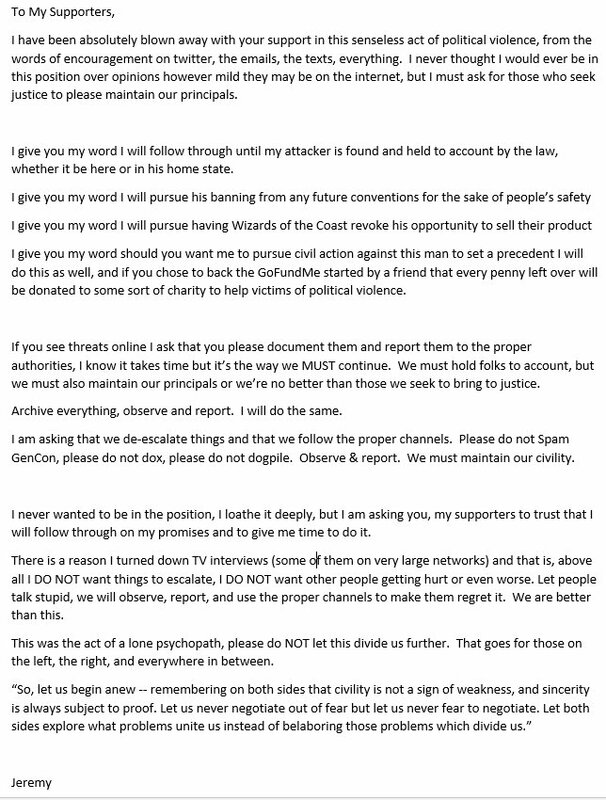 This begs the question as to whether or not personalities within GenCon had any role in this attack, and if they’re working to protect those involved. In addition, according to Jeremy, it appears that the Indianapolis police will not pursue the assailant, who will likely not serve any jail time, because Jeremy was drinking. All parties seem to be doing the very best they can to sweep this assault under the rug. That of course is wholly unacceptable, and therefore this needs to become a national story. I implore all readers to forward this story to local and national media entities, including as many conservative bloggers and vloggers that you can think of. Bounding Into Comics has even more here, here, and here. Follow Jeremy Hambly on Twitter at Unsleeved Media and The Quartering. Help him support his fundraising efforts to effectively file a lawsuit here. We’ll update this story when more details are available.